If your 4×4 experience is limited to standard stock exhaust systems installed by the manufacturer, you might want to think about investing in an aftermarket performance Redback exhausts system to unleash the true beast that’s hiding under the hood. An aftermarket exhaust system can provide superior performance with fewer horsepower restrictions. With the economic factors being constantly in play, it’s no wonder most 4×4 manufacturers use affordable parts in the exhaust system which don’t optimize the performance. And even though it’s tempting to buy a cheaper exhaust system, you risk the possibility of losing your vehicle’s performance. If you want to win a race or conquer steep hills or rivers, you’re better off opting for Redback exhausts or any other type of performance exhaust. Performance exhaust pipes are usually larger in diameter, so you get increased flow of the exhaust gases. However, you have to ensure the exhaust pipes you choose are the correct size for your specific engine. If the pipe is too large, your vehicle may still not perform to your expectations. If you’re concerned about superior performance, you need additional power, something an aftermarket exhaust system can do. Another difference between a stock exhaust and an aftermarket performance exhaust is that the pipes are curved by the use of flexible rods in the construction of the aftermarket exhaust systems. By using a technique known as mandrel bending, these rods are placed inside the pipes and serve as a preventive measure against all types of collapse, and keep the pipe diameter stable without any restrictions. This is an unique way to ensure more energy flow. 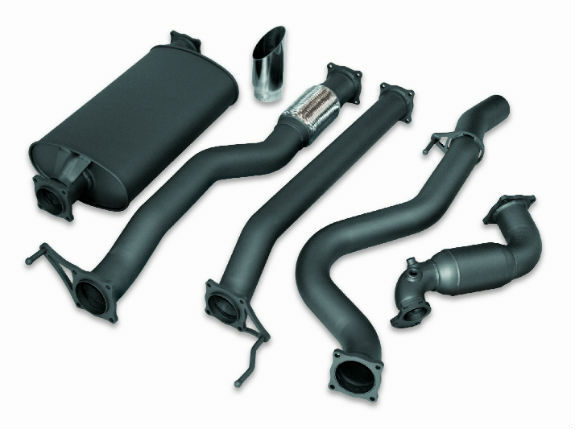 When looking for the ideal aftermarket exhaust system, pay attention to the materials it’s made from. Standard steel isn’t the same as stainless steel. Eventually, standard steel will get rusty and wear out, while stainless and aluminized steel are extra durable and rust and corrosion resistant and are by far the superior choice. And last but not least, a performance exhaust gives your vehicle an enhanced look which other people will notice. Even though appearance are not the main reason that you opt for a performance exhaust, large tips and a polished look add a new dimension to the appeal of your vehicle. Besides the visual appeal, an aftermarket performance exhaust will have an impact on the sound quality that your engine will produce. If you want to make a lasting impression, the sound is a strong factor to take into consideration. There’s a big misconception amongst Nissan Navara fanboys regarding bonnet guards, for some reason.